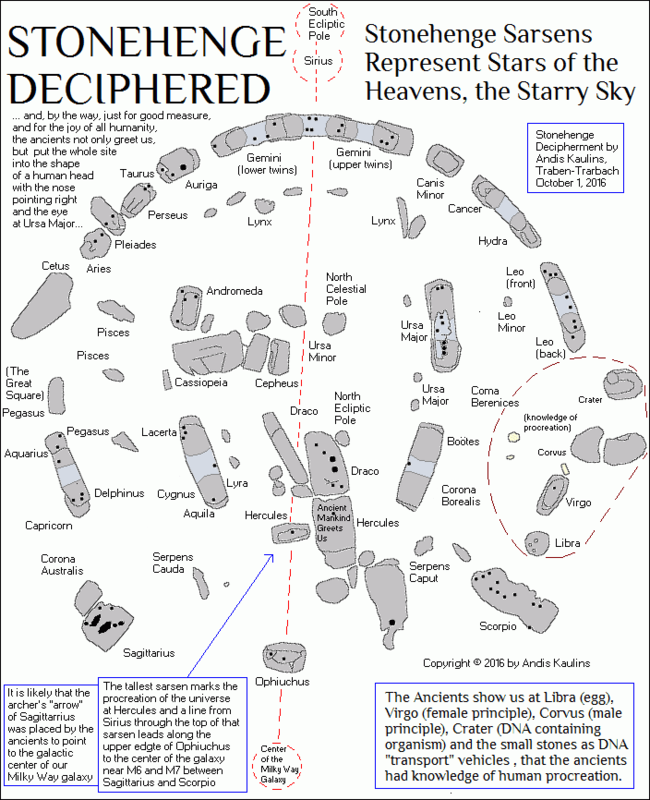 This is the first in a number of postings of a new decipherment of Stonehenge. You will very likely never see Stonehenge with the same eyes again. Thereafter we shall be presenting numerous of our own photographs of Stonehenge, detailing the decipherment with text-labeled explanatory photos. This decipherment supersedes our previous Stonehenge work, which was based on limited photographs of others prior to the year 2005. In 2005 we traveled to England and took our own comprehensive photographs on site, photographing Stonehenge 360° around the entire circle. It has taken us 11 years, off and on, to complete the evaluation and decipherment. These first two aerial decipherment images are dedicated to the memory of my father, Arvids Kaulins, who would have turned 102 years of age today, had he lived that long. Rest in peace. Decipherment of Stonehenge: 2 of 2 - Look at the whole image as a head facing right .... this is the view that the ancients intended, with greetings! Although we do not know him personally, we must make special mention of Nicholas R. Mann and his book Avebury Cosmos. Taking note of the galactic understanding presented there of the importance of the Milky Way ca. 5000 years ago, we were previously able to decipher the Avebury Henge Circle standing stones, and we published our decipherments of Avebury Stone #10 previously at this blog. 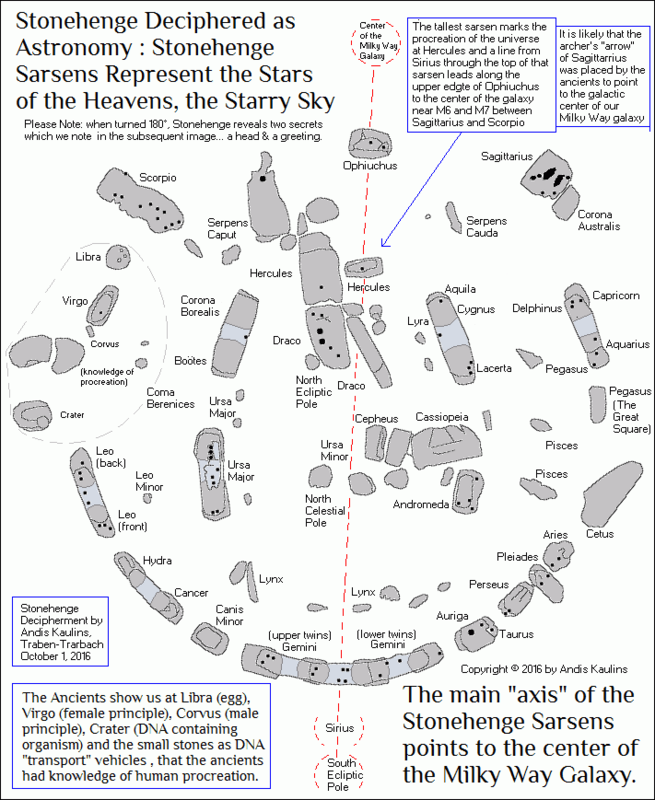 We then applied that "galactic" knowledge taken from Avebury to the Stonehenge sarsens, presuming that a similar astronomical system of orientation had been followed throughout the centuries and millennia. Make sure you look at our photographs as we post them over coming weeks.